Posh substitutes Paul Taylor and Tom Nichols close down Ed Upson of MK Dons. Photo: Joe Dent/theposh.com. Furious Peterborough United manager Grant McCann accused his players of lacking heart and desire following a 1-0 Checkatrade Trophy defeat at the hands of MK Dons at the ABAX Stadium tonight (October 4). Posh bowed out of the revamped competition after two straight defeats and McCann was angry with the way it happened. MK Dons made seven changes to the team that won a League One fixture at Oldham on Saturday and would have won by a far bigger margin, but for the heroics of Luke McGee in the Posh goal. Posh centre-back Ryan Tafazolli challenges Kieran Agard of MK Dons for the ball. Photo: Joe Dent/theposh.com. “I won’t tolerate players not giving 100 per cent for the shirt,” McCann blasted. “We were lacking heart and desire and it’s so disappointing to see a team of mine play like that. “We stood off them. We gave them all the space they wanted. There was no desire to close anyone down. “When you sense a team is getting on top of you, your instinct should be to make a tackle, to grab someone, to do anything to break up play and slow them down. “We didn’t have the desire to do any of that. We were a team of nearly men. It was a really lacklustre performance and one that we can’t afford to repeat. McCann handed a first start to 17 year-old striker Deon Moore. 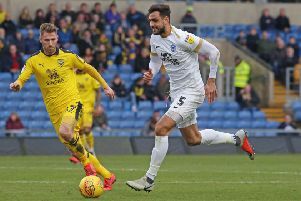 He rested both of his first-choice strikers Tom Nichols and Paul Taylor, but it’s now eight games without a win in all competitions for Posh who face third-placed Bury in a League One fixture at the ABAX Stadium on Saturday (October 8), a game that will be televised live by Sky. “I felt it was the right time to take Tom Nichols out of the side and to get a rest into Paul Taylor,” McCann added. “Sometimes when you don’t score for so long, the best thing that can happen is to have a break. “I didn’t want to bring Tom on at all, but the way the game went I had no choice. He should have scored as well, but somehow managed to find the side-netting after taking the ball off the goalkeeper. “But it took us 85 minutes to put them under pressure and to create chances. “It was a difficult debut for Deon, but he had no support from behind. I wanted George Moncur, Marcus Maddison and Gwion Edwards to play closer to him, but it didn’t happen. “I wouldn’t blame the formation. We have created loads of scoring chances with this formation, but for some reason we were just way off the pace tonight. “I was pleased with Luke McGee. He was excellent in goal and saved us from a heavier defeat. “I wanted to win this game and to put on a performance to take some momentum into Saturday, but that’s an even bigger game now. Posh star Marcus Maddison was suffering from cramp towards the end of tonight’s match, but it’s not thought to be a big problem. Posh travel to Barnet for their final fixture in the Checkatrade Trophy on Tuesday, November 8. Barnet are also out of the competition after losing 5-0 at home to Norwich Under 23s.